The announced acquisition of Valspar by Sherwin Williams, while consistent with our broad view on consolidation does not really tick any of the boxes we identified. This is not a segment facing massive offshore competition, nor is it oversupplied. Both SHW and VAL have growth, albeit offset for VAL by currency. 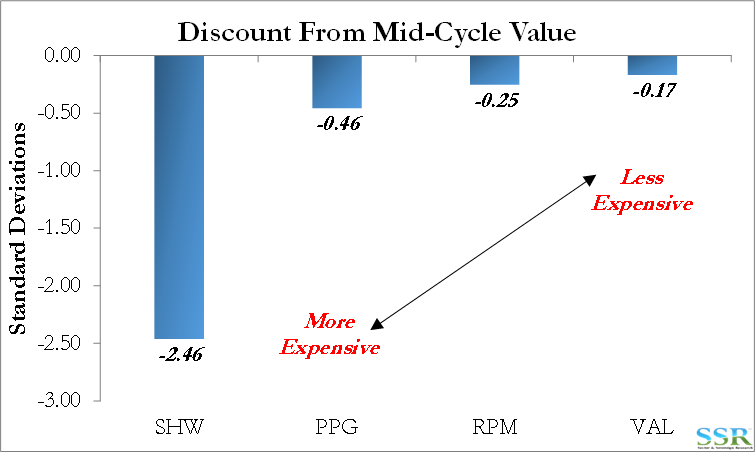 There is an opportunity to cut costs, but SHW is paying a very full cash price for VAL and it is not clear that the potential accretion justifies the cost. The coatings space has seen some significant tailwinds for the last several years from falling raw material costs – pigments and now latex pricing – and SHW may be buying VAL at a point in the cycle when that aspect is as good as it gets – TiO2 will bounce off the bottom at some point and already we see companies like DOW cutting acrylate capacity in the US because of poor economics. The segment has also been a beneficiary of consolidation – and it is possible that this deal is a bridge too far for the regulators given the focus on decorative paints in the US. Note that the transaction has price and exit clauses triggered by required divestments. We would be sellers of both stocks – SHW because we think the price is too high and it is all cash and SHW valuation is already stretched, and VAL because the risk that the deal does not go through (or go through as planned) is not insignificant. If the deal goes ahead as planned this is probably a good thing for PPG as it is further consolidation which at the same time distracts SHW and would give PPG some possible degrees of freedom for other deals. We still believe that PPG is the better way to play the coatings space.